As you have seen, or read, on a lot of our blogs thus far, there is one common thing you can notice in the way realtors are, the way that we push homes for sale in Idaho, the certain ways that Idaho Falls real estate thrives and is worked, and searching for real estate Idaho Falls with sites such as realtor com Idaho, we all have a certain style of going about getting the real estate business done. One of the other things that we fully share, in a common ground, is that we love sushi. All things sushi. 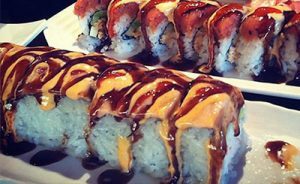 Now, one of our realtors here at The Group Real Estate did a review of Blue Hashi here in Idaho Falls, but we finally made it up to Rexburg to indulge in Dong’s sushi joint. One of the first things that I love about Dong’s sushi is the small set up. The accommodation there is amazing and they create an atmosphere for you that is wholly inviting. As you go into the store, you are welcomed right away, and even if those who work there, don’t fully speak English, they are truly there to help you out and want to make sure that you have a wonderful experience. They want to make sure that you have a great experience there, getting you the best service, and making the best sushi around. Yes, I just said, making the best sushi around. 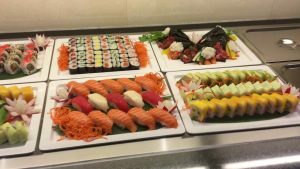 Now, with the review of Blue Hashi already being done on one of our agents’ blogs, we decided to look at another place to enjoy some sushi. One of the main reasons for this, is Steve Thomas, a good friend of mine, fellow bodybuilding competitor, and CEO of the NXT LVL Empire, is a sponsored athlete at Dong’s sushi. After winning his first show over a year ago, he landed a “gig” there as an athlete who helps promote, through social media, Dong’s restaurant. The home town feel is one thing that we loved about going there. This is always a great staple with going to any good restaurant. But, now, lets get into the food there. If you have eaten sushi, and it is good sushi, you know how bad, and awful, bad sushi can be. You know what I’m talking about: the stuff you get from Broulims. Going to a place like Dong’s, you are sitting right next to the kitchen, and can watch the owner step back behind it, making your rolls right in front of you. Sushi can be known to be expensive, as well. At Dong’s you get a really great selection for a great price, especially for sushi. Plus the fresh feel, the fresh taste, and the fresh look of the fish (especially), is something you normally can’t find in Southeast Idaho. Dong’s proves that wrong. The sushi is always fresh and the different types of specialty rolls they have there far outweigh any other sushi places you will eat at. Especially something that is frozen and then refrigerated at Albertsons or Broulims. There are a few reviews for Dong’s that tell you that they would rather eat at Broulims or Albertsons. This is all due to not spending the one or two extra bucks to get a true specialty roll. They have a roll at Dong’s called the Amazing. And it is simply called that for great purpose. Please make sure you try that one when you go in next. As a member of Team NXT LVL, this is something that I love to talk about, is a place that has a family value, sets aside itself to really bring a family feel and loves to make sure that the atmosphere is great. As you go to Dong’s sushi make sure that you try out some amazing sushi and get to chat with the owner, Adam. You will not be disappointed.